This lovely iced cake is quick to prepare and may be kept in the freezer until it’s time for it to be served. And the beauty of it is that you may substitute any flavor of ice cream/sorbet/sherbet/granita that you choose. This version uses raspberry sorbet, vanilla ice cream with toasted almonds, and passion fruit sorbet, with a raspberry sauce known in French as a coulis. To make your own coulis, blend a pint (1/2 liter) of fresh or frozen raspberries, pass through a sieve to remove the seeds, and add 1 or 2 tablespoons of sugar to sweeten. You will need a 1-quart (1-liter) charlotte mold. But if you don’t have one, not to worry. You may substitute a small soufflé dish or even use a saucepan. Anything with more or less vertical sides. Prepare the coulis and set aside. Remove the raspberry sorbet from the freezer to soften. In a shallow dish, combine 4 tbsp. crème de cassis with 2 tbsp. water. Have your charlotte mold standing ready. Dip a ladyfinger in the cassis-water mix — quickly, but on both sides — and stand it upright along the edge of your mold. Repeat until the ladyfingers line the entire circle of the mold. The raspberry sorbet should be soft enough to handle by now. Scoop it into the bottom of the lined mold to form a smooth bottom layer. Place the mold in the freezer. Remove the vanilla ice cream to soften. Turn the oven on to gas mark 6 (400 F, 200 C). Scatter the slivered almonds over the bottom a baking dish. Place in oven until the almonds begin to brown, about 5 minutes. Be careful — this can go very fast. As soon as you begin to smell the wonderful aroma of the toasting almonds, remove them from the oven. In a bowl, mix the softened vanilla ice cream with the toasted almonds. Remove the charlotte from the freezer, add a new vanilla-almond layer and place back in freezer. Remove the passion fruit sorbet to soften. This is a great time to take a break. Pour yourself a glass of some Christmas cheer, find a comfortable chair and put your feet up for 5 minutes. You’ll find that by the time the sorbet has softened, you’re in a much better mood. Remove the charlotte from the freezer and add the final passion fruit layer. 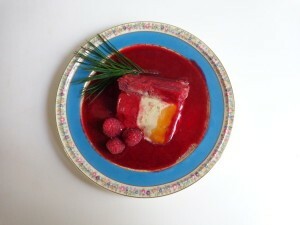 Spread half of the raspberry coulis over the top, using a spatula or knife to push it in between the ladyfingers along the edges. Now, using a sharp knife, like a bread knife, trim off the tops of the ladyfingers to the height of the mold. Put back in freezer. You are now essentially done with this cake until serving time. Just before serving, remove the charlotte from the freezer. Have a lovely plate standing ready. Fill a deep pot halfway with hot water. Dip the charlotte into the water for a minute or so, being careful not to let any spill into the mold. Remove, dry off the mold, run a knife around the edge and jostle the mold to loosen the dessert from the bottom. Place your lovely plate over the mold, invert and tap to unmold. If the charlotte doesn’t unmold easily, dip it back into the hot water for 30 seconds. With the charlotte standing on the plate, use a spatula to spread the softened raspberry sorbet (now at the top) over the edge and around the sides of the dessert. Mix the remaining 1/4 cup of the coulis with 2 tbsp. or more crème de cassis. Spoon it onto the serving plate around the cake. Decorate the top with the fresh raspberries. (You may not need all 16, in which case pop the extra ones into your mouth. Isn’t Christmas a wonderful time of year?) For a very festive look, add a candle or a sparkler. Serves 8.